Singapore – noisycrayons has launched a social media campaign for Sands® Cotai Central, a world-class integrated resort of Las Vegas Sands® that is situated along the Cotai Strip of Macao. The campaign positions Sands® Cotai Central as the resort that pulsates with life and sensational experiences, night and day. 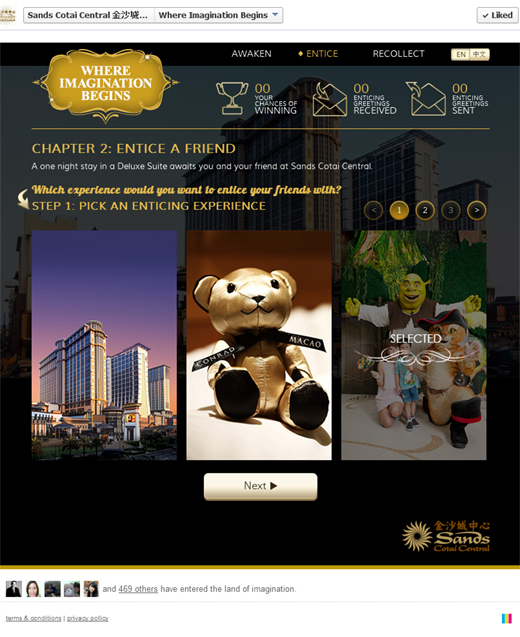 To showcase world-class hospitality, fine accommodation, amazing live entertainment, exquisite dining and luxury duty free shopping at Sands® Cotai Central, noisycrayons conceptualised Where Imagination Begins, a social-by-design initiative that activates tourists and locals to send greetings that feature a Sands® Cotai Central experience to their friends. The initiative, that is deployed via a customised application on Facebook and mobile devices, brings the audience through an imaginary journey of great indulgence where wonder and decadence are unleashed at Sands® Cotai Central. A fan picks a Sands® Postcard, personalises a greeting and invites his friends to join him at the iconic integrated resort to win room stays. The mystery of a luxurious world awakens the imagination of the audience and creates an impetus for every member to become an advocate of the Sands® Cotai Central experience and reach for complimentary experiences of world-class entertainment, dining and shopping and accommodation. 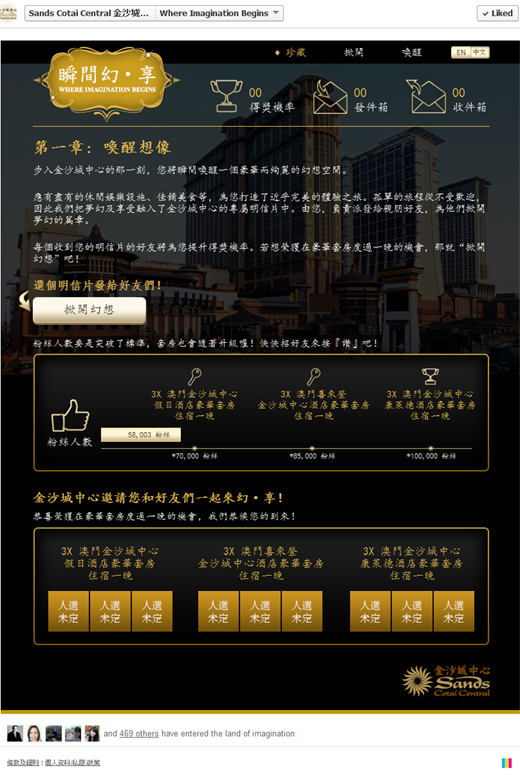 The digital consumer engagement campaign for Sands Cotai Cental, is managed by noisycrayons, a SPH Magazines affiliate.